This is a somewhat alternative view of the SECC (Scottish Exhibition and Conference Centre), which as you know is often referred to as the Armadillo. 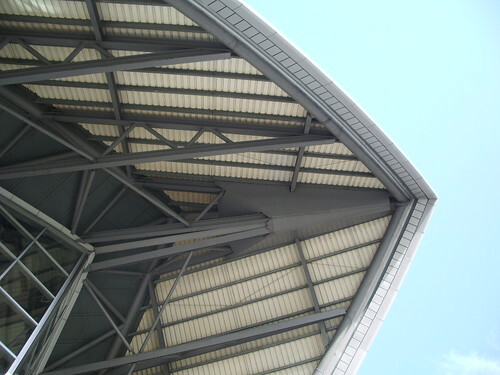 This is close up, looking up at the edge near the entrance to the Centre. 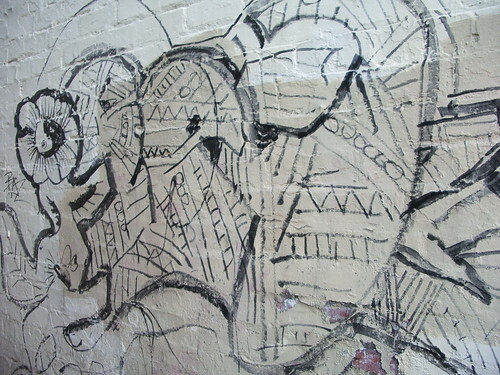 This can be found not far from Queen’s Park, at the bottom of Victoria Road. 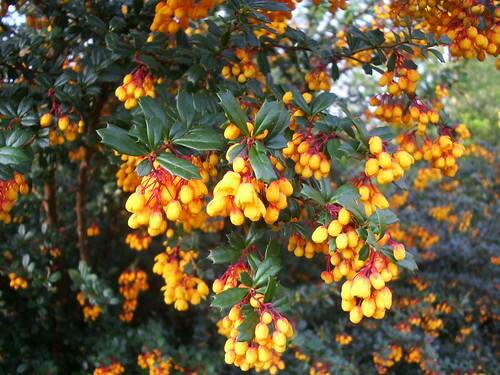 The last picture from Queen’s Park for now, I loved the little orange flowers on this bush. I have no idea what it is though – any ideas from the gardeners out there? 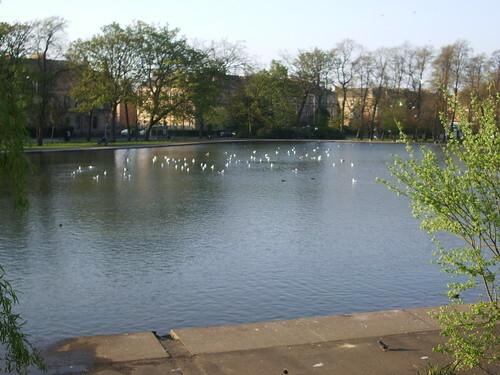 The lower (and larger) pond in Queen’s Park often has hordes of seagulls congregating round it, presumably to try and nick the bread being thrown to the swans and ducks. This lot were making such a racket, they reminded me of the seagulls in “Finding Nemo” (hence the title!). 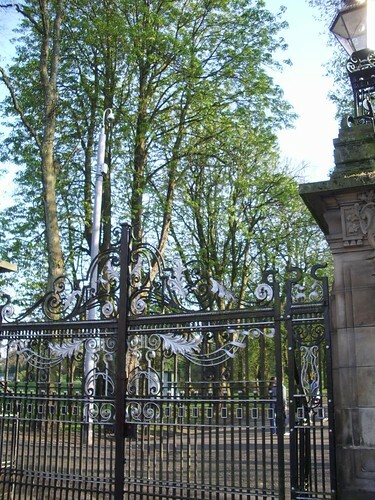 I can’t remember if I’ve ever shown these gates before – they’re at the entrance to Queen’s Park, at the bottom of Victoria Road. 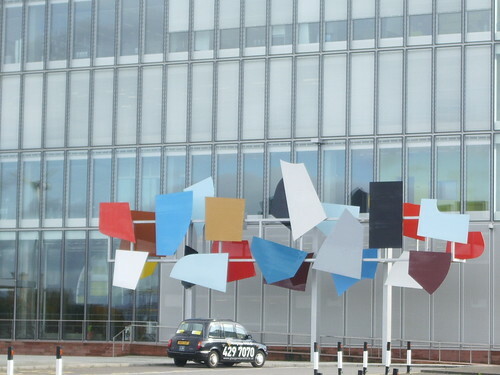 They’re a well-known sight – the flickr Glasgow Southside group was considering using a picture of these gates as their icon, though they went with the Queen’s Cafe ice cream in the end. 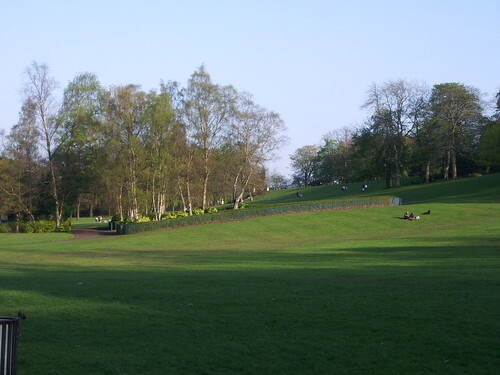 Although it was early evening there were still quite a few people enjoying Queen’s Park on Sunday, and soaking up the sun (we never know here when we’re next going to get any!). The reason we went to Queen’s Park at the weekend was to see if we could see any ducklings, although I was pretty sure (and was right) that we were too early for that. We did manage to see some baby coots, but the two photos I managed to take of them (before my camera batteries gave up) were both rubbish, too far away for my not-particularly-strong zoom and also not helped by one of the adult coots constantly swimming in front of them, presumably to protect them from the paparazzi! 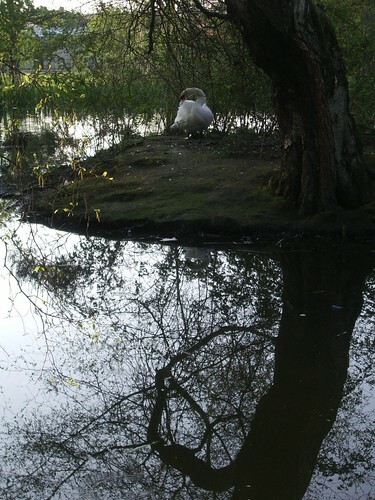 I did though manage to catch this fine fellow preening himself, he seemed quite unpeturbed to be photographed, probably he was aware how lovely he looks. Thank you for all the get-well-soons. I’m back working, not 100% but should be visiting blogs again soon (I have another deadline coming up, so looking at other people’s blogs is ideal procrastination 😀 ). 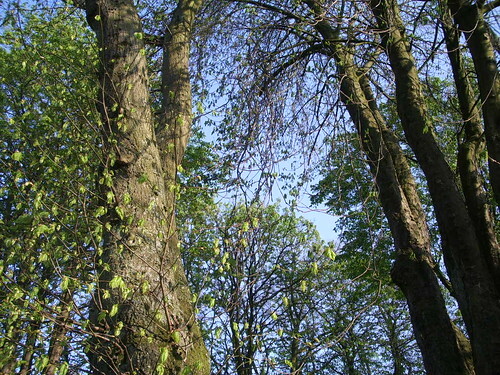 These trees in Queen’s Park give the game away – spring is definitely here (if someone could just tell the temperature that, that would be appreciated!!). 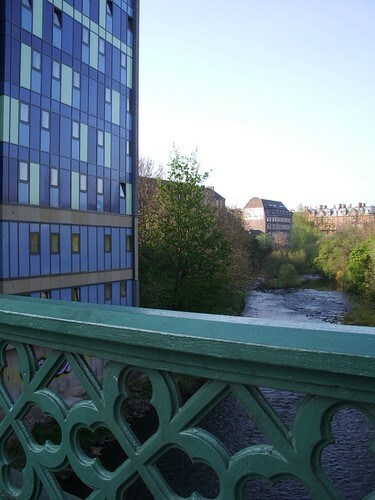 This new building on the left, on the banks of the River Kelvin, seems to have been being built for ever. Recently though the scaffolding was taken down and it has emerged from its metal chrysalis. It is going to be another hall of residence for students, and has been built by a private company. In the foreground you can see the bridge stopping the pedestrians on Gibson Street from falling into the river. Apologies that I’ve not visited other blogs for a few days. I have picked up a virus (medical, not computer) and feel really rough if I spend too long on my computer 😦 Hopefully normal service will resume soon.